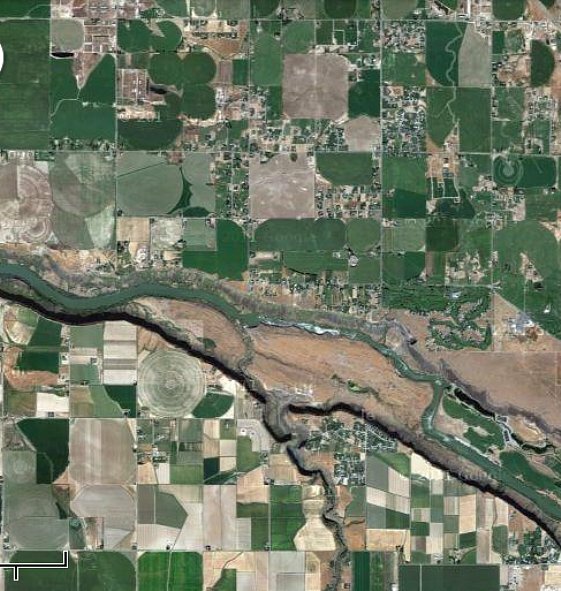 Above: Satellite view of Snake River Canyon, Idaho near Twin Falls. BY THE TIME the first three weeks of the first great 'flying saucer' wave of summer 1947 had passed, there had been such a conflagration of reports from across the United States and Canada that there had been little time for anyone -- civilian or military -- to stop and consider. For many, the national story had turned local as witness reports sprang forth from both large cities and small towns across 45 states. But for those keeping tabs on the national situation, the focal point seemed to center on the Pacific Northwest, and particularly the states of Oregon and Washington. Partly it was attributable to the fact that the first reported sighting of 'flying discs' had occurred near Mt. Rainier in Washington state. Nearly every newspaper account in the coming weeks would mention that sighting, and both Mt. Rainier and the state of Washington became nearly synonymous with the phenomenon in the public mind. Other Pacific Northwest firsts included a simultaneous multiple-witness sighting of up to 20 discs by police in Portland, Oregon and sheriffs in Vancouver, Washington on July 4, 1947. And the first picture of a flying disc to go national -- also from July 4 -- was that of 27-year old Frank Ryman, a Coast Guard photographer who snapped his picture from the north shore of Lake Washington near Seattle. But though the coastal states of the Pacific Northwest drew the lion's share of attention, it was in fact in the Rocky Mountain state of Idaho from which some of the most spectacular witness reports would emerge. And of which the most significant may have been that of A.C. Urie and sons, of Twin Falls, Idaho. MOSCOW, Idaho, June 30. (AP) -- Seven persons here saw a "flat, shining disc" oscillating across a clear, sunny sky yesterday, "and we weren't drunk or crazy," one of them said today. He was Frank Lark, who said he saw his neighbors, Mr. and Mrs. Lewis Cook, gazing at the sky shortly before 1:30 p.m. Looking directly overhead, he said a "big, shiny disc" was moving rapidly "above cloud level" in an easterly direction. Mr. and Mrs. Ernest Hellman, also neighbors, joined the gazers and said the object moved in a rapid oscillating motion. "It wasn't a plane; we know what a plane looks like," said Mrs. Hellman. The party was joined by two daughters of Mr. and Mrs. Cook, and then the object was gone. The "flying discs" have invaded Magic Valley! About 4:30 p.m. Monday, eight to 10 of the much-publicized "flying discs" flew over Galena summit in a "V" formation. There were two eyewitnesses -- Hunter Nelson, forest ranger at the Russian John ranger station, and Walter Nicholson, Twin Falls. The two men were marking timber on South Cherry creek about three miles south of Galena summit. Nelson mentioned that he heard a buzz, then looked directly overhead and noticed the "flying discs." He called Nicholson's attention to the soaring, shining objects and the two men watched them for about a minute, before they went out of sight. Nicholson said he heard no noise. Nicholson said there were about eight or 10 of the discs in a "V" formation. The left wing of the formation contained five of the discs in a perfect line, but the right wing of the formation seemed to waver, he reported. He said it was impossible to tell how many discs were in the right wing. "It wasn't anything like an airplane," he remarked. "At first I thought the reports of the discs were nothing but jet-propelled planes, but it is nothing like that." The report was notable for several reasons. First, one of the witnesses was a forest ranger, presumably familiar with the sight of flocks of birds soaring overhead in the wilds of Idaho. The second notable aspect was the keeping of formation and perceived tremendous speed of the objects, and that they were "shining". But perhaps the most remarkable detail was that the forest ranger's attention had first been attracted by a buzzing sound -- the first such report associated with a 'flying disc' (on June 27 George Clover of Bellingham, Washington had reported sighting three objects and remarked "the engines didn't sound like no gas engine", but there was no further description of the sound). Over the next 10 days there would be a fresh report from Idaho every day. Some of them could easily be likely explained by natural phenomena or aircraft. For instance, a solo disc described as looking like "a big ball of fire" was reported on July 2. The next day Lt. Gov. Donald S. Whitehead and Boise Justice of the Peace J.M. Lampert described having watched a "strange comet-like object in the sky" for 20 minutes on June 24th, and that it "seemed that it went below the horizon merely by the rotation of the earth". That same day, July 3, B.G. Tiffany of Union Pacific railroad reported that on June 6 he and his crew had spotted nine silver colored objects shaped much like planes with faint black markings at the tips of their wings. And on July 4 R.L. Dempsey reported sighting two "flying saucers" making the same sound as a Boeing B-17 Flying Fortress at an altitude of 20,000 feet. All of these reports could possibly fall in the category of misidentification by people caught up in the national excitement over the new phenomenon. EDITOR'S NOTE -- The following dispatch is by John C. Corlett, Idaho manager for United Press, a newspaperman of 15 years experience. BOISE, Ida., July 5 (UP) -- Just before dusk last night, as my wife and I and two friends were relaxing after dinner, a tiny white disc -- one of the mysterious "saucers" -- scudded across the sky at a terrific speed. We were entertaining friends and were relaxing in the garden when my wife suddenly pointed skywards and cried, "Look!" In just about the time it takes to turn your head, the silver object was nearly out of sight. Both my wife and I, and our guests, Mr. and Mrs. V.H. Selby, caught a glimpse of the tiny object. Selby is a Boise artist. During the last few days we had discussed the various news stories carried about the discs, many of which came from the Boise area, and, frankly, I had been a bit skeptical of them. But the disc was unmistakable, even in the three or four seconds time during which we had a chance to see it. The disc traveled at a high rate of speed. It appeared first in the northwestern sky, apparently coming from the general direction of the Oregon-Washington line, and travelled southeast. There was no noise -- absolutely none that we could hear, either before or after the disc shot by. The sky was clear, and we could not have mistaken a cloud for the disc we saw. At one point in its progress the disc was almost directly overhead. It was flying fairly high, I'd judge at about 10,000 feet. Until last night I didn't believe in them. But now I know that those "saucers" aren't just a myth, part of someone's imagination. It took seeing them with my own eyes to believe in it. Dumbfounded crewmen of a United Airlines plane flying from Boise to Portland Friday evening joined a horde of Portland-Vancouver area residents in describing "flying discs" seen Friday. Discs also were reported in many other regions of the West, but the carefully qualified statements of Capt. E.J. Smith, First Officer Ralph Stevens and Stewardess Marty Morrow remained a new high in observations. In an interview at Portland before taking off for Seattle, Captain Smith, a veteran of 14 years with United Air Lines said an object at first believed to be an approaching aircraft was sighted by Stevens, who was at the controls eight minutes after take-off from Boise at 9:04 P.M.
Stevens flashed his landing lights as a signal there was another aircraft in the area. There was no response. "What the devil is that?" Stevens demanded. Captain Smith said he looked and made out not only the "disc" Stevens had mistaken for a plane, but four others, about evenly spaced in a line to the south of it. Smith estimated their distance at "about 30 miles," but said they were clearly visible against the afterglow of the setting sun. They radioed a report to the Boise CAA tower, then called Stewardess Morrow to the flight deck to verify what they saw. Shortly afterward, the five discs disappeared, then three more appeared in front of them, with a fourth flying "by itself, way off to the right," Smith said. "Step outside and look to the southwest about 15 miles and see what you can find". The operator reported he could see nothing, which Smith said meant the discs were farther away than he had previously estimated since they were not visible to the tower operator. He was some 30 miles from Ontario at the time, he said. The airliner was at 10,500 feet when he saw the first disc, Stevens reported. The discs seemed to be flying in about the same direction and to be climbing about at the same rate as the airliner. However, when the plane reached a height of 8000 feet, the discs still were in sight and somewhat higher. The first group veered to the left of the airliner before disappearing, then the second group in "loose formation," appeared. The objects finally "merged, then disappeared, then came back in sight and finally vanished, again in the northwest," Smith said. "When they did finally disappear, they went fast." "You can see a big plane at a great distance for a long time before it disappears. But no object I know of could disappear so quickly as these things." Both Smith and Stevens, who had been joking about sighting "flying discs" before taking off from Boise, were obviously embarrassed but earnest when telling of the strange objects. Stevens has been flying for United three years. Large numbers of flying discs Saturday were reported seen both on Independence day and several weeks ago by many Magic Valley residents. Within a 20-minute period at least 35 of the unidentified flying objects were seen by nearly 60 persons who were picnicking at Twin falls park Friday. 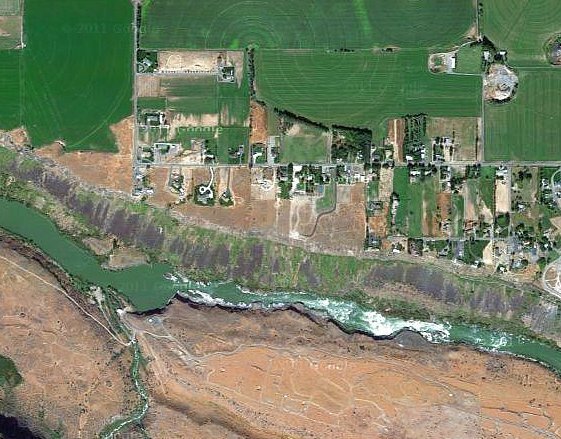 One flying disc was reported seen Friday evening by a Twin Falls family, two more by a Twin Falls resident late Saturday afternoon, and two others on June 25 and 26 by Buhl residents. Largest number of the mystery devices reported anywhere in the nation was seen Friday afternoon by a group of picnickers at Twin falls park. Coming in three flights about 10 minutes apart, 35, and possibly more, flying discs were sighted by nearly 60 persons who had been expectantly scanning the sky after word of the arrival of the first flight had spread through the picnic grounds. The first flight of seven flying discs was seen at 2:50 p.m. by a picnic party including Mr. and Mrs. W. Montooth, Mrs. Ray Bush, Mrs. M.J. Wigle, Mr. and Mrs. J.H. Grinsted, all of Twin Falls, and their guests from Goose Creek, Tex., Mrs. H.H. Mitchell and Mr. and Mrs. A.E. Mitchell. The flying discs were seen by all but two of them. Mrs. Grinsted said the group had been joking about the flying discs shortly before she saw Mrs. Bush looking skyward. "Edith," she said, "What are you looking at -- some of those flying saucers?" "There they are," Mrs. Bush replied, pointing to the sky. Describing the first flight, Mrs. Grinsted said four flying discs were in a "V" formation with two others off to one side and the seventh trailing behind. Mitchell said the discs were "kind of round" and heading west at high velocity and great altitude. They left no vapor trail, he related, and he could not hear their noise, if any, because of many exploding firecrackers in the vicinity. "The next bunch was sort of churning," said Mrs. Grinsted in explaining how the second flight of either nine or 10 discs were milling as they quickly spiraled upward. They were seen at about 3 p.m. The second flight appeared at about the place where the first flight was seen, according to Mitchell. They gained altitude very quickly while circling, he related, climbing almost out of sight before they departed at high speed in a westerly direction. More than 20 persons saw the second flight, and as word quickly spread among the picnickers, nearly 60 persons were watchfully waiting when the third and largest flight was first seen directly overhead by Mitchell at 3:10 p.m.
"I distinctly counted 18," he said, "before they climbed so high that only two or three could be seen." The third flight also milled around as it circled and climbed before heading west. "And when they started to leave, they really moved," the Texan said. Mrs. Grinsted said that some persons who saw the third flight counted as many as 24 flying discs. Their speed made counting difficult. Along about 4:40 p.m. Saturday, two flying discs were seen by Bus Cowham, operator of the Bowladrome. Cowham said he was driving his car east on Elizabeth boulevard, not thinking about flying discs when something attracted his eye to the north. "At first," he related, "I thought It was a kite some kids were flying." After looking more closely Cowham said he thought they were shiny flat pans soaring west through the sky. He described them as silvery and said they appeared not more than six or eight inches across. Unable to estimate their speed, altitude or distance away, Cowham said they were traveling "pretty fast," were flying beneath a cloud, were out of sight in less than a minute and looked about one-tenth as big across as the moon would look. He got out of his car to see them better and said they left no vapor trail and that he could not hear them. "They looked like a skimming tin can lid except they were traveling in a straight line," he explained. A lone and particularly brilliant disc was reported seen at 7:50 p.m. Friday by Mr. and Mrs. Wesley Ulrich from their residence on Filer avenue west. They said it was as bright as the reflection of sunlight off polished aluminum, but lost much of its shininess when it apparently became surrounded in a pall of smoke. The single disc was flying extremely high, they said, and made no noise. They described it as round in shape. In relating the size of the flying disc to that of celestial objects, the Ulrichs said the disc appeared much bigger than a star would appear, and was about one-third the apparent diameter of the moon. A disc a day was reported seen by Mrs. Brooks Stover, Buhl, and her grandson, on June 26 and 25, respectively. She saw a disc at about 10:30 p.m., which she first thought was a reflection until it began to vibrate vertically and lose its shape with the addition of a streamer. Pocatello, Idaho, July 7 (AP) -- A touring Seattle resident reported to the Pocatello Tribune today that he saw a flying disc float to the ground in front of him, stop a few seconds, then take off again. He said the disc was about the size of a farm wagon wheel and was surrounded "by a tube that had an enlarged opening at one end, like a funnel, and ending in a tapered point at the other." H.C. McLean reported the incident by letter, saying he saw the disc Sunday just after dawn. "In the middle of the disc," McLean's letter said, "I could make out the bulge as if a plate had been welded on to the disc, and there were two narrow strips of metal running almost parallel to each other above and below the midsection. "Something held it upright, and then the disc was subjected to a number of short jerks, moving forward each time a foot or two. The funnel part of the tube was set into the disc rim so that the latter could roll freely, and after moving a distance of about 20 yards it rose easily and began at once to climb. "I examined the place where the disc had landed but it touched the ground so lightly that it left no mark. "I am convinced that the disc's flight was controlled, that it gave out signals indicating its position and that it is harmless." Six persons reported seeing the discs in flight over Pocatello this morning. "With the mountainside as a background we saw the 'saucers' come in very fast, slow down jerkily, then flutter down like leaves," said Mrs. Walter Johnson, Dishman, Wash., who was visiting her parents at Butler's Bay, Idaho, on the St. Joe river. "My father, Ben Beeman, was hoeing in the garden at about 6:30 in the evening. He shouted for us to come out of the house. We saw those nine things -- some of us counted only eight -- in a loosely formed group, streak along very fast. They didn't make a sound. There was no wind. Suddenly they stopped in midair, then started again. When they reached a point over a clearing in the timber, they stopped again and settled down a few at a time until all were out of sight." "The mysterious part was that we couldn't see them after they landed," said Mrs. Johnson. "We could see them flutter down into the timber yet we couldn't see that they did anything to the trees." Mrs. Johnson described the "saucers" as having a shape something like a football, fluttering with the brilliance of a mirror in the sunlight. But, she said, they must have given off the light themselves, because the sun itself was not visible. The Johnson family had been camping for several days and had not seen recent newspaper or radio accounts of persons seeing the mysterious phenomenon. More than 10 relatives and several neighbors were said by Mrs. Johnson to have witnessed the landing. "We're going to hike up the mountainside Tuesday to see what we find," Mrs. Johnson said. "I am deathly afraid of the things. If we find them we won't touch them. We just wonder if they are man-made contraptions or something God has sent." Listed among those observing the landing were Mr. Johnson, who is working near Butler's Bay on road construction, their children, Mrs. Johnson's parents, a sister and her daughter, two neighbor men, and a neighbor woman and her children. Another neighbor's son reported to Mrs. Johnson that he also saw it. WALLACE, Idaho. July 7 -- The first report of a flying disk being seen in the Wallace area came this afternoon from five employees at the Hecla tailings plant, west of Osburn. It was first spotted high in the air by Joe Vander Vloedt, screen operator at the plant, who called to other workers, Conrad Preston, C.J. Landis, Ervin Zorb and Eddie Jackson, who said they watched it for nearly two minutes until it disappeared over the hills of Terror gulch, heading in a westerly direction. Vander Vloedt said he was first attracted by what he described as a "flash in the sky." Landis, who called the Wallace Press-Times to report the incident, described it as a "circular plane," and said there was a reflection "each time it bobbled about in the air." "It was traveling fast and was very high," said Landis. "There was no sound and the object would disappear momentarily; then flash brightly as it dipped or bobbled." The men said a plane appeared about two minutes later, but it was traveling in a different direction and they doubted it was attempting to intercept the disk. BOISE, Idaho, (AP) -- Three days of aerial search on an assignment to find a flying disc paid off Wednesday when for 45 seconds I watched a circular object dart about in front of a cloud bank. The object was round. It appeared black, although as it maneuvered in front of the clouds I saw the sun flash from it once. I was flying at 14,000 feet west of Boise, near the end of my third mission in search of the flying discs which have been reported over the Northwest and elsewhere. Frankly, I had given up hope of ever seeing one of the objects. I turned the airplane toward Boise, to begin a circular let-down over Gowen field and over the nose of the aircraft saw the object. I saw it clearly and distinctly. I turned the airplane broadside to it and pulled back the plexiglass canopy so there would be no distortion. The object was still there. It was rising sharply and jerkily toward the top of the towering bank of alto cumulus and alto stratus clouds. At that moment, it was so round in shape that I thought it was a balloon. I opened my radio and called Boise CAA communications station. The logs shows the call was made at 12:17 p.m. I asked if the weather bureau had just released a balloon. The answer was no, that a balloon had not been released for several hours. With that I snatched my camera out of the map case and began firing. I held the button down for about 10 seconds, and then looked again. The object was turning so that it presented its edge to me. It then appeared as a straight black line. Then, with its edge still toward me, it shot straight up, rolled over the top of this maneuver, and I lost sight of it. I asked the CAA and the Gowen field control tower if there were any aircraft in the vicinity. There was a P-51 fighter plane in the area, but it was behind me. There was a Fairchild C-82 packet flying over Boise, but I watched it pass beneath me. I saw the circular object east of the city, toward the Anderson Ranch dam. I do not know how far away it was. It had the relative size of a quarter. The clouds against which I saw the object were forming in the Camas prairie region, about 50 miles east of Boise. I had flown around them about an hour before. The base of the clouds was at 13,000 feet. Their tops must have extended to 18,000 or 20,000 feet. The object could have been 10 miles away, or 40. I do not know. If it was a great distance from me, its speed was incredible. The greater distance an object is from the watcher, the slower its speed should appear. This circular thing was maneuvering very swiftly. The P-51 that was in the area was instructed to scout the region, and its pilot went there. He landed shortly after I did to report he had not seen anything. Patrols of P-51s were ordered into the area to keep searching until darkness. I had the airplane fueled and took off again for two more hours of flying in the same area, and then went over Owyhee reservoir, where discs had been reported earlier in the day, but did not see anything more. I do not know if the pictures will turn out. They have been flown to San Francisco for processing at the Eastman plant there, since they are in color and require special handling. Now, about myself. I have flown 18 hours in the past three days looking for discs. I have chased and discarded as nothing several flashes I believed I saw in the sky. Much of my flight today was above 12,500 feet and I may have been tired from lack of oxygen. It appeared black against the clouds. The sun flashed from it once. It turned its edge toward me and vanished. I do not believe I was self-hypnotized into seeing anything actually not there. I'm in the same spot as Kenneth Arnold, the man who first reported discs, and Capt. E.J. Smith of United Airlines, whose entire crew watched circular objects near a twin-engined transport one evening at dusk. What I saw was no airplane. It was moving fast, but I don't know how fast. I don't know how big it was. If it was scores of miles distant it was very large. When I landed from today's second mission, three men of the Idaho National guard were waiting for me in the operations room. They said that they had seen an object performing similar maneuvers, round and black in appearance, against the clouds, and that it disappeared "very fast". It was in the same area where I saw the object. Their names are Warren Noe and Bob Ayres, crew chiefs, and Fern Sabala, National Guard photographer. While I am writing this, in comes William W. Hunt of Blackfoot, Idaho, who was driving 14 miles east of Boise when he saw an object from his automobile. He just wanted to tell me about it. Johnson's account was notable not only because he was the aviation editor for his newspaper and well-versed in aircraft types, but especially because he was an Army Air Force veteran pilot with 2800 hours flying time, including his time as bomber pilot in the Pacific theater where Johnson had flown the B-29 Superfortress -- the most technologically advanced bomber of its time. In addition, Johnson at the time of his report was a member of the Idaho Air National Guard, and in fact had made his sighting while piloting an AT-6 of the 190th Fighter Squadron. The P-51 Mustang that joined the search was from Johnson's squadron and came at his request. And the three National Guardsmen on the ground reporting their own separate sighting were likewise members of Johnson's National Guard unit. Johnson would later state in a report to the Air Force... "...I cannot bring myself to the point of thinking I did not see anything. The impression of the moment was too vivid, too realistic, and I knew in the air when I saw that partial slow roll or barrel roll, that I was not a victim of illusion." BOISE, July 24 -- Seven V-shaped objects which appeared about the size of fighter planes were reported flying within 1,500 or 2,000 feet of a civilian aircraft over the Mountain Home desert Sunday. The pilot told the Idaho Statesmen, Boise, that so far as he could determine the objects were not United States planes. He notified the Civil Aeronautics administration radio station of his experience and the 190th fighter squadron of the Idaho national guard reported it to McChord Field, Washington. The Statesmen quoted the pilot as saying he was "frightened and shaken" by the experience. He said the objects, in tight formation, but not the type of formation used by military aircraft and they were flying "at tremendous speed." The pilot, the Statesmen said, has wide experience in aviation. He trained pilots during the war and operates an airport in the Boise Valley. He made his information available only on the condition that his name would not be used, the paper said. The pilot described the objects as being in the shape of a V, with a solid, circular body under the nose of the V.
There was no evidence of any means of propulsion, he said -- no propeller, and no smoke trails indicating jet or rocket power. There were no markings of any kind. The color, he said, was a shade he "couldn't describe and hadn't seen before." He said he had the objects under observation for two minutes. The pilot said he was about ten miles west of Mountain Home flying toward Boise at about 10,000 feet on the right side of the highway. He said the objects were flying at about 9000 or 9500 feet. He described the formation as in two lines of three each with the seventh object either in the center, between the two lines, or above them. 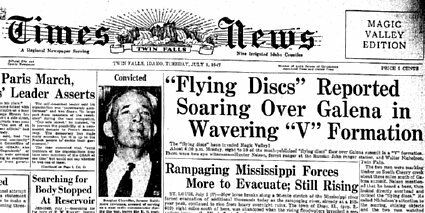 BOISE, Idaho, July 29(AP) -- It's flying disc time again in Idaho and the United Air Lines pilot who spotted the latest one says "they ought to be kept off the civil airways." "If it is real it must be some sort of military experiment and if that is the case they ought to arrange to keep the objects off the civil airways." Army and Navy spokesmen have denied knowledge of the discs. Gibian, who talked to the Idaho Statesman by telephone from Pendleton, Ore., became the second United pilot on flight 105 to report seeing the flying object. His predecessor was Capt. E.J. Smith who said he spotted two groups of discs July 4, near Emmett, Idaho. Smith's story came during the climax of the flying discs reports, which started in late June in the state of Washington. During early July there were few states in the nation without at least one report of a disc and persons in numerous other countries, including Japan, also said they sighted the objects. Gibian's disc -- or whatever -- was the first reported since word of the objects tapered off about two weeks ago. The pilot said his first officer, Jack Harvey, also saw the object last night. They said they saw a round, flat object in the sky west of Mountain Home, a village 45 miles east of here. Both men said they thought the object was an airplane until "in a matter of seconds it disappeared, apparently going away from us." Gibian said if the object was 40 miles or so distant from the airliner, it was as big as an airplane. The Civil Aeronautics Administration's communications station here reported there were no other aircraft in the sky in the vicinity of Mountain home at the time Gibian and Harvey reported seeing the object. BOISE, July 29 (AP) – Speculation about the "flying discs" revived today after a United Air Lines pilot -- the second in the past month -- reported sighting a saucer-like object last night in the sky 45 miles east of here. One of the airmen said it "might have been" a cloud. Capt. Charles F. Gibian and First Officer Jack Harvey reported the incident to the airways control tower and to the United operations office in Boise before landing their mainliner at 8:40 p.m.
Four hours later after landing at Portland, Ore., Gibian was quoted by a newsman as saying "I'm not convinced this was a disc. This might have been a small fragment of a stratus cloud which dispersed as we watched it." In an interview Gibian was quoted as saying that the "only logical explanation was that it was a bit of rapidly forming and disappearing cloud. But I say that's logical because I don't know what I saw. It wasn't an airplane and if it was an object when it vanished it was going like hell." Harvey, who first sighted the object, was quoted as saying "the object appeared to have considerable substance." CASTLEFORD, July 30 — The 'flying discs" have returned to Magic Valley after a lapse of more than two weeks. Dwight Brown reported Wednesday that he had seen one of the elusive and mysterious "discs" about two miles west of Castleford. He said the "disc" sounded like an outboard motor and was headed southeast over Salmon canyon. Brown observed the "disc" at about 7:10 a.m. Wednesday. Two weeks later, the last report of 1947 from Idaho -- and perhaps the most potentially significant -- would be that of A.C. Urie and sons. Above: Snake River Canyon, Idaho. BY THAT TIME the multitude of flying disc sightings had become almost generic in the vagueness of their descriptions: round or elliptical aircraft, sometimes seeming to be either brightly lit or polished metal reflecting the sun, and capable of superfast speeds. But though hundreds of witnesses to flying discs would make their own attempts to describe what they had seen, it had almost always been from a great distance, and the information of real value -- from a reliable estimate of the size of the craft to the means of propulsion -- were frustratingly absent. That is, until A.C. Urie and sons got what they said was a close-up view. Just as Magic Valley and the nation were starting to let go of lampposts after reeling under a welter of flying saucer reports, two more Twin Falls county men revived speculation on the mystery with vivid descriptions of discs they saw. From A.C. Urie, who operates the Auger Falls Trout farm, six miles west of Blue Lakes Ranch in Snake river canyon, came perhaps the most detailed account of one of the fast flying objects the nation has yet produced. The flying saucer Urie saw was skimming along through Snake river canyon at a height of about 75 feet at 1:00 pm Wednesday. At 9:30 a.m. the same day, L.W. Hawkins, Twin Falls county commissioner and former county sheriff from Filer, also saw two circular objects soaring along at a great height near Salmon dam 40 miles southwest of Twin Falls. "I obtained a close-up view of the flying saucer as it passed the trout farm at 1 p.m. Aug. 13 going down Snake river canyon at a height of about 75 feet from the canyon floor. I would estimate the speed at about 1,000 miles per hour." Urie explained that the incident occurred while the two boys were coming across the river from the north side in a boat. He had become concerned about what was delaying them, and had walked down toward the river to see if they were all right. "I had a side view of a distance of about 300 feet and almost on a level with the thing," Urie continued. "Two of my boys, Keith and Billy, were below me and they also saw it at about a 45-degree angle. They both got a bottom and a side view, and we were looking at it from the south side of the river facing toward the north. The boys saw it coming about a half a mile up the canyon, and we all lost sight of it in less then a mile." While the impression was still vivid in their minds, the three got together and made rough sketches of what they had seen. These, in turn, were the basis of the artist's conception of the strange affair by Vic Goertzen of Twin Falls for the Times-News. "It was all one color -- sort of a light sky blue with a red, tubular fiery glow at the side of the top or hood," Urie continued. "The canyon floor is rough at that particular point, and it rode up and down over the hills and hollows at a speed indicating some type of control faster than the reflexes of man. It is my opinion it is guided by instruments and must be powered by atomic energy, as it made very little noise -- just a s-w-i-s-h as it passed by." Urie described the size as about 20 feet long by 10 feet high and 10 feet wide, giving it an oblong shape. It might be described as looking like an inverted pie-plate or broad-brimmed straw hat that been compressed from two sides. Pressed for his candid opinion of just what it was, Urie said that he was convinced that there was something to this flying saucer situation. "I know a number of people who have also seen them, and I know that they're not just imagining something or trying to get their names in the paper," Urie commented. "I do know that it scared the boys and made me feel pretty uneasy," he added. "Yes I did," he replied without hesitation. "I'll have to admit I've been skeptical all along until I saw it with my own eyes. I can't say what it was, but I can say there's something in the air." Hawkins related that while at Salmon dam Wednesday morning, a sound resembling the echo of a motor caused him to look upward, and there he saw two circular objects that reflected light. They were traveling at a great speed and higher than most airplanes, according to Hawkins. His general description, however, corresponded closely to those of hundreds of persons who reported seeing flying saucers after Kenneth Arnold, Boise businessman, had touched off the deluge by telling of coming upon nine disc-like objects while he was flying in his private plane in Washington. Thereafter, the nation became increasingly flying saucer conscious, creating a state of mind that made it possible for four teen-age Twin Falls boys to cause a mild sensation when they built a model flying disc and tossed into a local yard July 10th. This was subsequently revealed as a hoax, following investigation by the army and FBI. Thereafter the saucer reports tapered off into a few scattered incidents until the question was revived by this week's occurrences. Speculation has ranged from mention that the discs could be army or navy guided missile experiments, or that they could be similar experiments by some foreign country, to "something out of this world." Whatever they are, a lot of people have seen something. Had the sighting been reported five or six weeks earlier, it would have undoubtedly become one of the parade of stories fed across national newswires at the height of the wave of reports. But by this time, flying disc reports were mostly limited to local coverage, and Urie's report was no exception. Fortunately, within days the FBI would arrive on the scene. Above: The "artist's conception" of Urie's sketch as published in the newspaper, and Urie's sketch as found in declassified FBI files. BY AUGUST 1947 the military response to the flying disc sighting reports was still very much ad hoc. On the West Coast the military investigation had been centered at Hamilton Air Base in California. From there two investigators from A-2 military intelligence -- Captain William Davidson and Lieutenant Frank Brown -- had criss-crossed the western U.S. investigating witnesses and filing detailed investigative reports. Meanwhile in Washington D.C., Brigadier General George Schulgen, the number-two man in the Directorate of Intelligence at the Pentagon, had been organizing a preliminary intelligence collection effort on the new phenomenon, including calling on the expertise of the foreign technology analysts at Wright Field in Ohio. And as a vital part of it all, Schulgen had negotiated with the FBI to aid in the intelligence collection effort on civilian sightings. Enclosed please find the newspaper account carried by the Twin Falls, Idaho "Times News" on August 15; together with a sheet of paper on which A.C. URIE attempted to sketch his impression of the instrument which he claims to have seen. Concerning URIE's sketches, it may be noted that he believed the outer edge which he attempted to create in his drawing to have been about a foot through. URIE likewise believed that the turbine or exhaust flame which he and his sons claim to have seen was about a foot through and extended at least to the back end of the device. The flame did not appear to taper off nor to widen out toward the back. BILLY and KEITH URIE stated that they could see a knot on the side of the device from which the flames were shooting, and that they could see daylight between the exhaust flame and the side of the device. The flames did not leave any smoke or odor. 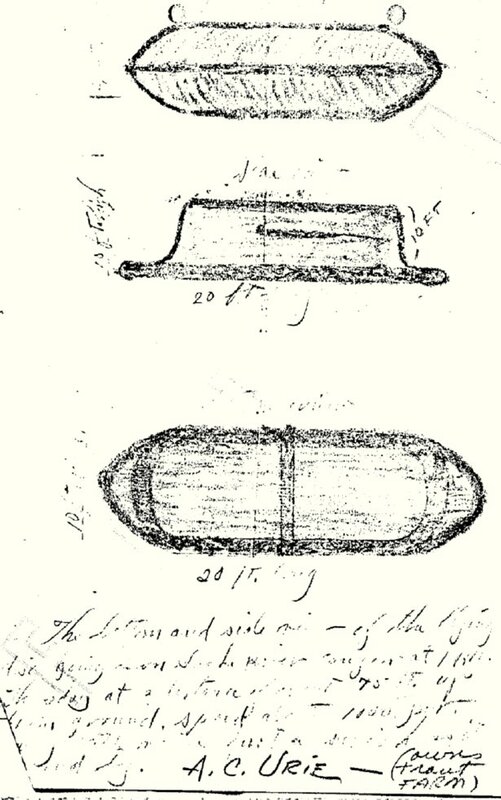 The URIE boys thought that the "side view" sketch should show that the device was more sharply angled from bottom to top, while URIE himself thought that it was more streamlined and curved. URIE said that the instrument came to a pointed or rounded top. In his notations, URIE mistakenly said that he had seen it on Thursday. During interview, he stated that it actually had been on Wednesday, August 13, 1947 when he and his sons saw the contrivance about 1:00 P.M.
URIE explained that he had sent his boys to the river to get some rope from his boat. When he thought they were overdue, he went outside his tool shed to look for them. He noticed them about 300 feet away looking in the sky and he glanced up to see what he called the "flying discs". He said he could only see it for a moment before it disappeared behind a hill which obscured his view. URIE further stated that the contrivance was about seventy-five feet in the air. 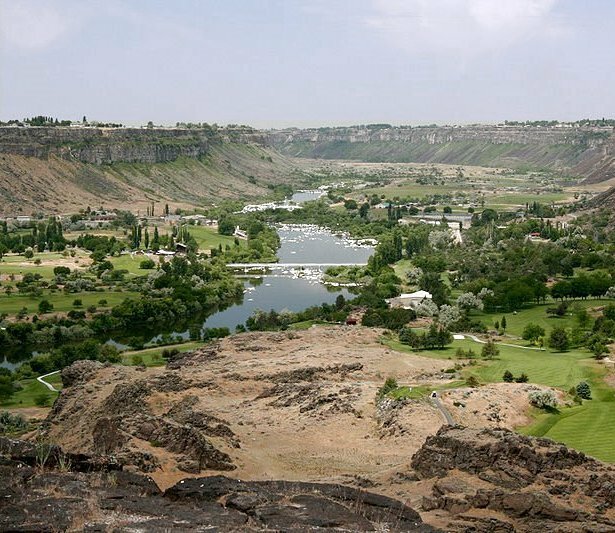 URIE resides in the depths of the Snake River Canyon, which is about four hundred feet deep and twelve hundred feet across at that place. According to his account, the contrivance was about three hundred feet below the rim of the canyon and he saw it against the steep walls of the canyon on the far side. He described its color as sky blue and stated that he doubted if it could be seen against the sky. He likewise said that it was purely by chance that he saw it. It did not spin like a top. As the machine went by the URIE place, the trees over which it almost directly passed (Mormon Poplars) did not just bend with the wind as if a plane had gone by, but in URIE's words, "spun around on top as if they were in a vacuum." KEITH URIE, eight years of age, said he first saw the machine coming down the canyon, heading from east to west and following the contours of the round. BILLY, age ten, saw it almost immediately. Both watched it fly out of sight behind a tree in a matter of moments. They said they then ran to their Father and learned that he too had seen the machine. URIE seemed completely sincere about the incident. He said his wife and daughter were in the house at the time and had not seen the machine. He questioned his brother, who also lives in the canyon, but his brother had been eating at the time and had seen nothing. URIE and his two boys maintained that they had never before seen one of the discs. URIE, when interviewed, appeared to be a sober, middle-aged man. JOHN BROSNAN, the "Times News" reporter who originally furnished Special Agents with information about the incident, likewise stated that URIE appeared completely sincere about the machine. No further attempt was made to locate L.W. Hawkins, inasmuch as J.H. Brown, who was with HAWKINS at the time, was interviewed. BROWN's name was withheld form the newspaper because HAWKINS and BROWN were fishing at Salmon dam while BROWN was supposed to have been working in Twin Falls. BROWN said simply that he and HAWKINS could hear a roar. They looked up and could see two instruments flying at a great height, which BROWN mentioned might have been between four thousand and six thousand feet. However, he said he had no idea how large the devices were and consequently, they may have been several miles away. He said that he and HAWKINS were satisfied they had seen something and they were very doubtful that they had seen two planes. A copy of the report was forwarded to Wright Field, where it was filed away to be forgotten... at least, for a time. IN SEPTEMBER OF 1947 General Nathan Twining at Wright Field pushed for the creation of a special investigatory body of the flying disc phenomenon, which by January, 1948 had coalesced into Project Sign, the first official Air Force investigation of the flying discs. As a result, in 1949 Project Sign was replaced by Project Grudge, whose mission was to "debunk" all flying disc reports. The ultimate vehicle was to be a mammoth report which took each incident and "explained" it. And the bulk of that report would consist of the work of Dr. J. Allen Hynek, the scientific consultant to both Sign and Grudge. When it became clear to me and others within the project (as a result of personal conversations with officers of colonel rank and higher) that the official Pentagon policy was to debunk UFO sightings, intelligence analysts and investigators alike (myself included, since at that time I felt the lack of "hard" evidence justified the practical "it just can't be" attitude) did their best to come up with "commonsense" explanations for each new UFO report. I stress the word "each," for there was no attempt to look for patterns in the reports; each report was regarded as though it were the only UFO report in the world. This made it easier to find some individual explanation, even though it was sometimes far-fetched. It might even be stated as a sort of theorem: "For any UFO report, when regarded by itself and without reference to similar or related reports, there can always be found a possible commonsense explanation, even though its probability may be small." There is safety in doing this because it is quite true that the great majority of UFO reports turn out to be ordinary things like balloons and aircraft that people misidentify, very often honestly. In a country where it rarely ever rains, the weather forecaster is quite safe in predicting fair weather! When I first became associated with Project Sign, I too was eager to do my part in dispelling what I sincerely thought at the time to be a public fantasy, a popular craze. I distinguished myself by dismissing the following reported UFO as an "atmospheric eddy"! "There is clearly nothing astronomical in this incident. Apparently it must be classified with the other bona fide disc sightings. Two points stand out, however: the 'sky blue' color and the fact that the trees 'spun around on top as if they were in a vacuum.' Could this, then, have been a rapidly traveling atmospheric eddy?" The Air Force was only to happy to accept my conjecture: "It seems logical" the Project officer wrote, "to concur with Dr. Hynek's deduction that this object was simply a rapidly moving atmospheric eddy." The fact that I have never seen such an "eddy" (or as far as that goes, never even seen one described in books) and that I blithely discounted other pertinent evidence, haunts me to this day. And as a result, to this day the report of A.C. Urie is one more of the thousands which have been listed as officially "explained" by the Air Force, to the edification -- or as in this instance, eddy-fication -- of us all. 1. Both of Dr. Hynek's books are available to be read online at the Saturday Night Uforia library. 2. The stories of Project Sign and Project Grudge will be covered in a future series early this summer.